While we were out hoeing the pumpkins a few days ago, I came across a familiar but unwelcome site… a cluster of tiny, hard objects on one of the leaves. I knew what it was immediately, we have had these before. It was a egg mass from a Squash Bug. I told my helpers to be on the look out for them. Usually the eggs are found on the under side of a leaf. They can also be found on a stem or anywhere else on the plant. Squash Bugs feed on all members of the Squash family of plants, pumpkins included. I asked my helpers to count the number of egg mass as we set out to smash them by hand. I was curious about how many there were and thought that you might be interested as well. 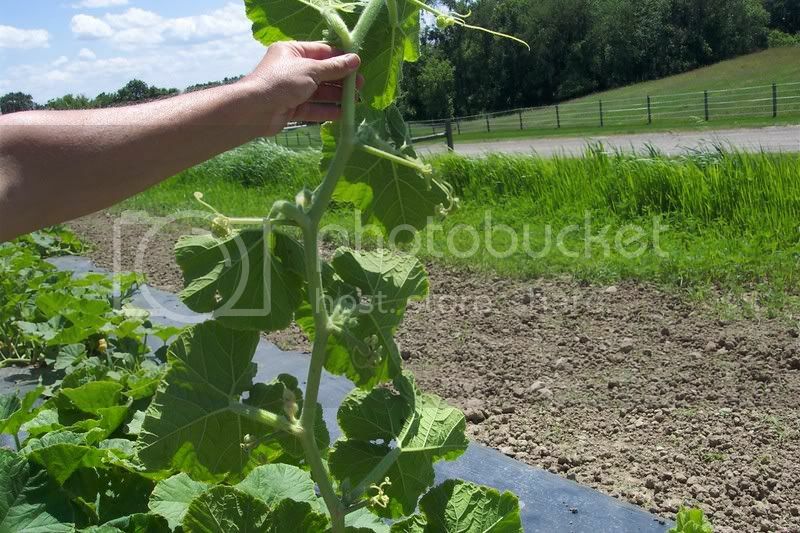 We have three 75 foot rows of pumpkins planted into black plastic mulch. The first row had about 75 egg masses, the middle row had 45 egg masses, while the last row had 85 eggs masses. Each egg mass ranged from a dozen to over 25 individual eggs per clutch. 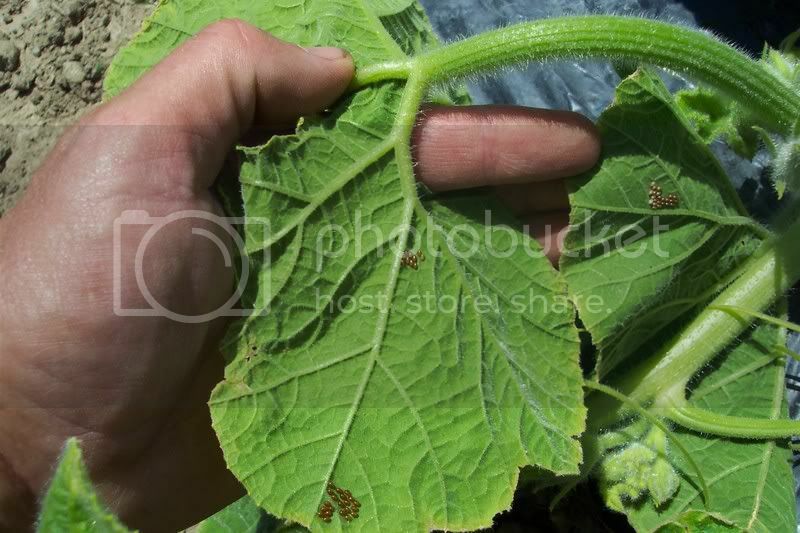 Anyway you do the math, that would have been a lot of Squash Bugs feeding on our plants! The easiest way to look for those bugs is to raise up the entire vine (or roll it over) and check each leaf. The eggs are very easy to spot. 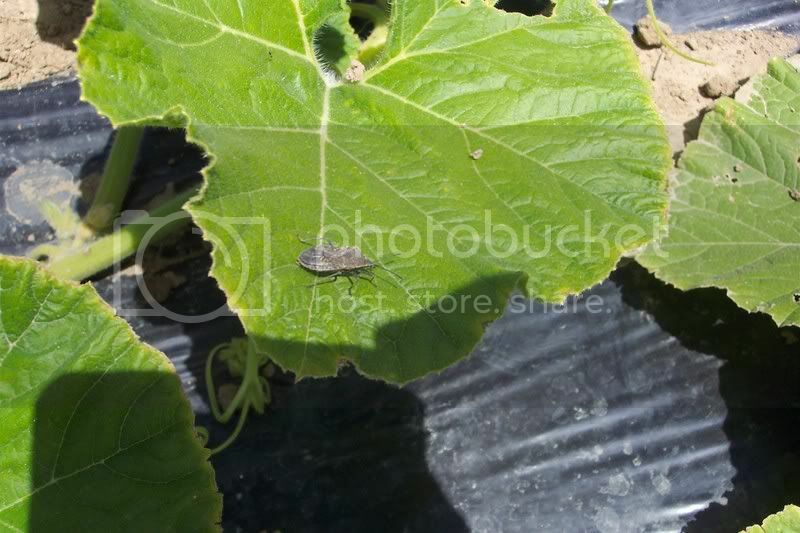 The Squash Bugs feed by sucking the juice out of the plant. after which the leaves turn brittle and begin to turn brown. The number of bugs that would have hatched could have caused us a major drop in yield or possibly even a crop failure. Squash Bugs like to hide from their enemies by crawling under debris. You can use this to your advantage by placing a board near your plant and leaving it over night. By morning, the bugs will have crawled under the board to hide (not knowing that it was you who placed it there). Lift up the board and dispatch any you find. Our problem is that we have plastic mulch that they like to hide under and couldn’t care less about any board. While they will do a lot of damage to your squash and pumpins, the good news is that they only breed once a year. I’ll check the plants now and then to take care of any bugs we may have missed. I’d like to share with you a new (to me anyway) flower that we are growing in the perennial garden. It’s called Bupthalum (sometimes spelled Buphthalum). Our Bupthalum has been blooming since the last week of June and is still going strong. The plants themselves stand over 4 feet tall, so you need to have a fairly large space for them or plant them at the back of your garden. We purchased the seed from Thompson and Morgan Seed company last winter. They seem to be fairly easy to grow. The packet had 50 seeds in it and I counted over 40 plants out in the garden this summmer… not a bad average. 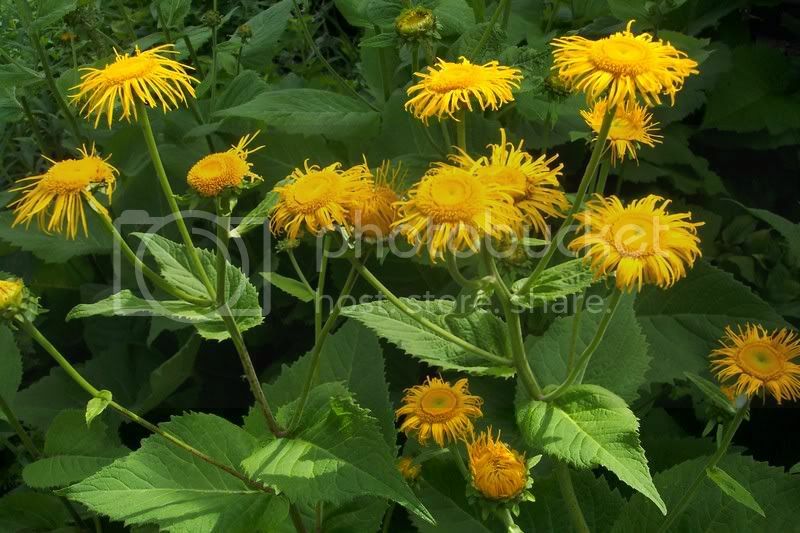 They also seem to be very hardy and are able to compete very well against weeds. They will not wimp out and die back at the first sign of stress. After three weeks of blooming the center of the blossoms are begining to turn a warm shade of brown, giving them a “whole ‘nother look”. 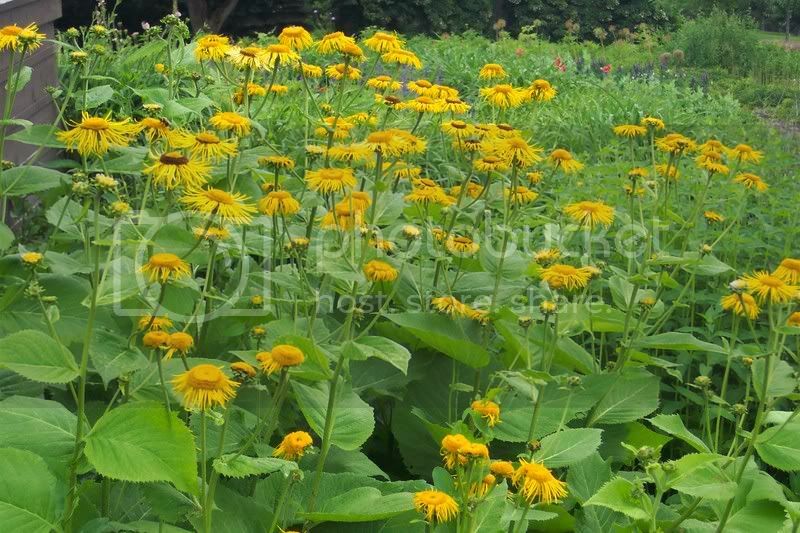 Bupthalum will give you plenty of enjoyment year after year for just a few cents for seeds and a little time to get them started.